It's been three days since my "Moving Experience" with the ants. This morning on my trail walk I came upon a group of undergraduate students that had gathered around a colony of Army Ants. They looked too familiar to me, so I asked how they knew they were Army Ants and they explained that they swarm areas and gather up all the living and dead stuff they can find to take back to their colony. There can be thousands of them and then all of a sudden they're all gone when they have no more food to carry off. Click photo to see larger picture of the bugs they are carrying. This was the exact behavior exhibited by the swarm of ants that were in my cabin. And I did notice that there were no more dead bugs to be found anywhere in the hallway or stairs. No wonder they didn't like my peanut butter idea. I did some studying when I got back from the walk. I was still wondering why they were carrying those egg-like things that I thought were larvae. They apparently have a base camp and daily undertake raids into the neighborhood, killing and taking home insects and small animals. They target the colonies of other ant tribes whose eggs they steal to feed their own young. I looked back on my photos and found I had a picture of some coming down the stairs carrying bugs. 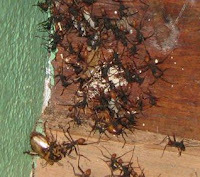 One website advised to leave them alone if they visit your house, because when they were finished you would have a bug-free home. Well, hadn't I been glad to have the bug-eating gecko protecting my door? So why not be excited about another natural form of bug patrol? It all made perfect sense now because the gecko had left the day before the ants came. I guess it doesn't take long in the jungle for any square foot of space to gather up a few insects. And so it seems they were just passing by as they scouted around for that day's supply of food for the pantry. Am I glad that I did not know they were Army Ants at the time because what I've read about them hasn't given me warm and cozy feelings since they are considered the most terrifying of ants. Their sole mission is to turn small creatures into skeletons in minutes. They are known to produce a faint hissing sound and a distinct odor. I remember smelling something very strong and wondered at the time if somebody had sprayed bug spray because of them, although I was certain the workers here would never do that. And it was quite obvious they weren't leaving the area. My studies said that tens of thousands of these miniature beasts merge and unite to form one great living creature. I now understood why at various areas of the hallway and room there was a "pile" of them. Click photo to see larger picture. Although you would think they could seemingly attack a human and finish them off, they don't bother with large creatures, so stepping aside, as I did, and letting them do what they're about, is the best way to handle them. It may take part of the day, but they'll clean up and be gone ... as they were in my original story. These ants' jaws are so powerful that Indians once used them to suture wounds by holding the ant over a wound and squeezing its body so that its jaws would instinctively shut, clamping the flesh together. Then the body was pinched off. It's good to know more about life in the jungle. 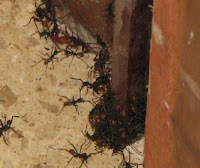 Wow, you don't hear expats talking about army ants. I'm like you I really don't like crawly things, but I realize they have a job to do and if I leave them alone, maybe they won't bother me.